A functionalized polyoxometalate/graphitic carbon nitride (PMo12/g-C3N4) composite has been constructed to promote direct electron and ion exchange based on a facile, rapid wetness incipient method. The PMo12 displayed a natural affinity towards the carbon support which facilitated enhanced reversible redox processes with surface-controlled electron diffusion. The g-C3N4-functionalized PMo12 composite promoted effective oxidation and reduction of the Keggin molecule addenda atoms with reduced overpotential without the mediation of a polymeric linker to promote their exposure and interaction. 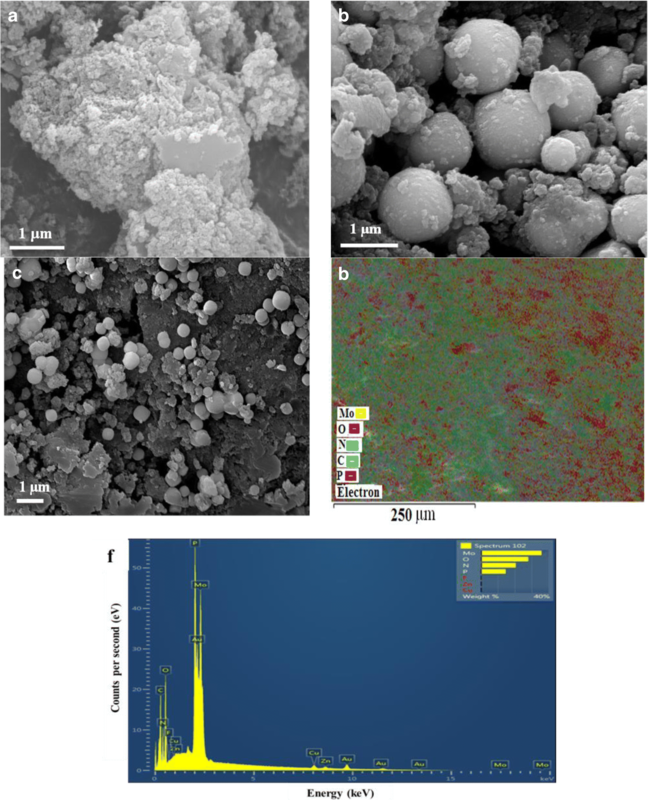 The g-C3N4 offered increased surface area for anchoring PMo12, structural stability at increased temperatures, and repeated cycling as well as control of the density and position of PMo12 as probed by scanning electron microscopy and nuclear magnetic resonance spectroscopy, respectively. These results demonstrate that PMo12 clusters are sensitive to their local environment, including the interaction with the support, which stimulated enhanced current mobility. Over the last decade, polyoxometalates (H3PMo12O40) have enthused many research activities over a broad spectrum of science, such as catalysis, materials, and medicine, because of their chemical properties such as redox potential, acidity, and solubility in various media [1, 2]. The PMo12 belongs to a large family of heteropolyanions with the so-called Keggin structure, where a tetrahedral XO4 core (X = P in this case) serves as a template for the aggregation of 12 MoO6 octahedral sharing corners and edges. Keggin-type polyoxometalates are capable of multiple redox reactions which make them particularly useful for electrochemistry . Their hierarchical crystal structure however greatly influences the accessibility of their active sites and the location of the protons [4, 5]. Owing to this unique cluster structure, PMo12 has very low surface area with negligible conductivity. Therefore, in order to maximize electron transfer kinetics, ideally each PMo12 cluster molecule should be electrically linked to a conductive substrate [6, 7]. According to the literature, PMo12 anchored to carbon-based materials in particular promotes multielectron reversible redox reactions. This allows each cluster anion to engage in electrochemistry and as such provide the greatest active surface for interaction with the electrolyte. Graphene in particular has been reported as a good support material due to its large surface area and high electrical conductivity. The difficulties related to the integration between PMo12 and graphene as well as effective control of the density and position of PMo12, however, are alleviated through an organic linker used to bridge the two components enabling contact and charge transfer at the interface [8, 9]. As a novel function material, graphitic carbon nitride is regarded as an ideal support matrix because of its exceptionally high surface area and the prospect of monolayer coverages even at high PMo12 loading. Concomitantly, g-C3N4 exhibits a unique stability, heat endurance, and chemical resistance to intimately bond PMo12 [10, 11]. In addition, the presence of nitrogen in g-C3N4 itself plays an important role in improving the wettability of the electrode with the electrolytes and concomitantly promotes electrochemical interactions [12, 13]. 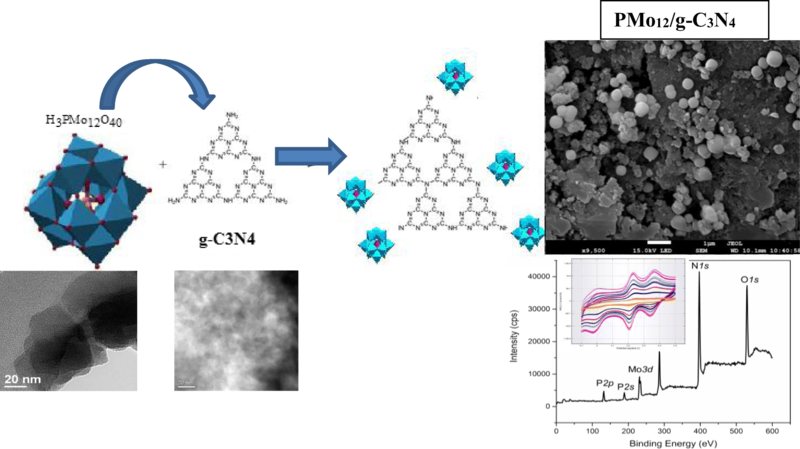 In this study, the aptitude of the mesoporous g-C3N4 to firmly anchor bulky PMo12 electroactive inorganic anions to facilitate enhanced redox activity and stability under catalytic conditions in the absence of an organic linker was explored. The morphology, electronic structure, and synergy of the composite materials towards exposing PMo12 active sites for improved interactions were probed by advanced spectroscopic, microscopic, and electrochemical techniques. The positive stimulus of the PMo12/g-C3N4 was validated by enhanced redox properties. The area under the current-voltage curve for PMo12/g-C3N4 was indicative of enhanced capacitive performance and increased electron density on the PMo12 anion and reducibility. The mesoporous graphitic carbon nitride, g-C3N4, was synthesized using a method previously developed with minor adjustments [14, 15]. In a typical procedure, 3.0 g dicyandiamide was added to 50 mL of an aqueous solution containing Triton X-100 at 60 °C under magnetic stirring. After evaporation, the resultant solid was dried in an air oven at 60 °C overnight, followed by heating to 550 °C at a heating rate of 5 °C min−1 in N2 and kept there for 4 h. Phosphomolybdic acid hydrate (PMo12O40·xH2O) was obtained from Fischer Scientific. The synthesis of the PMo12/g-C3N4 composite was accomplished by a simple wetness incipient method . In a typical procedure, the concentration of the PMo12 solution was adjusted to obtain 24% of the theoretical maximum surface coverage, corresponding to 10 wt%. The required volume of the solutions was slowly added to the g-C3N4 support (under vigorous magnetic stirring). After water evaporation, the resultant solid was dried at 100 °C, and then calcined at 350 °C for 2 h with a heating rate of 5 °C min−1 to obtain a desired composite. The obtained sample was denoted PMo12/g-C3N4. The morphology, composition, and particle size were probed by scanning electron microscopy (SEM, Zeiss Neon 40EsB FIBSEM). The PMo12/g-C3N4 local environment and stability with increased temperature were probed by 31P NMR analysis (Bruker, Advance 400 WB, DSX-400). 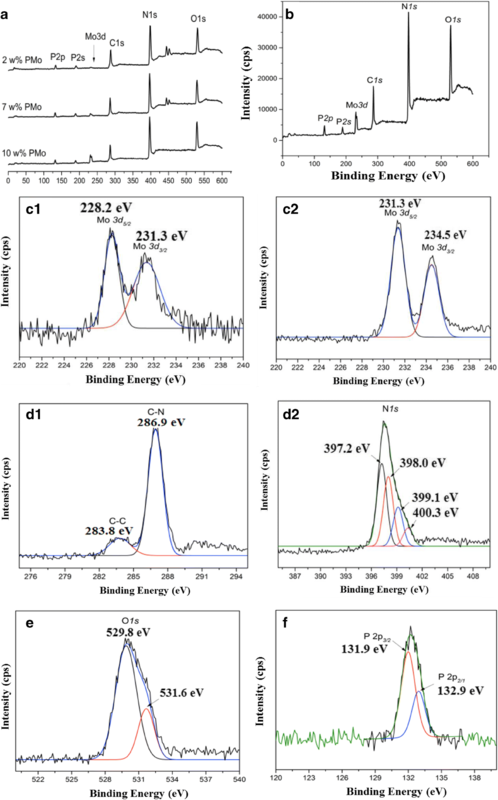 The cyclic voltammetry (CV) and electrochemical impedance spectroscopy (EIS) measurements were recorded on a multichannel potentiostat (Bio-Logic VMP2) in order to further probe any changes in the electronic structure of PMo12 clusters that resulted from their dispersion and electronic interaction with g-C3N4. X-ray photoelectron spectroscopy (XPS) was performed to measure the elemental composition, chemical state, and electronic state of the elements that exist within a material. This was done on an ultrahigh vacuum VG ESCALAB 210 electron spectrometer with Mg Kα radiation (hν = 1253.6 eV). The binding energy was referenced to the C1s peak at 283.8 eV of the surface-exposed adventitious carbon. The hollow to cloud-like morphology of the g-C3N4 surface is evident of its isotropic structure as shown by the SEM image in Fig. 1a. The PMo12 distribution is primarily controlled by the g-C3N4 platform architecture. After functionalization by PMo12, the PMo12/g-C3N4 composite shows a more complex surface morphology as illustrated in Fig. 1b. The PMo12 distributed all over the g-C3N4 substrate corresponded to a high surface coverage as shown at higher magnification in Fig. 1c. The energy dispersive spectroscopy (EDS) map and spectrum confirm (Fig. 1d, f) the presence of both g-C3N4 and PMo12 by the wide-ranging distribution and of the C, Mo, P, O, and N elements. Higher phosphorus composition corresponds to areas with a higher density of PMo12 clusters. 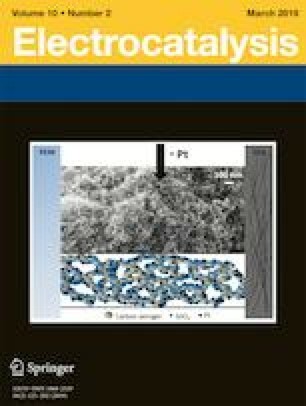 The overall unique ternary structure provides more electrochemically active sites for electrolyte exposure [17, 18], stimulating ion transfer which promotes the surface redox reactions and conductance as corroborated by CV and EIS. The phase, purity, molecular structure, and thermal stability of PMo12/g-C3N4 were probed by solid-state 31P MAS NMR analysis. The spectrum of PMo12/g-C3N4 compared with that of unsupported PMO12 is shown in Fig. 2. The number of 31P peaks for PMo12, shown in Fig. 2 a, corresponds to the existence of one intense PMo12 anhydrous phase and one less intense broader amorphous phase signal being in good agreement with the literature [19, 20]. After modification, the anhydrous phase peak moves downfield, i.e., the nuclei become less shielded, whereas the amorphous phase signal moves upfield, i.e., the nuclei become less shielded. This phenomenon and the small charge changes of oxygen atoms occur in the oxygen vacancy formation for the PMo12 signal; the presence of additional 31P MAS signals indicates a higher stability of supported PMo12, compared with that of the bulk material. Therefore, the downfield shift of 31P NMR is assigned to PMo12 crystallites with a different number of water molecules lost during impregnation, but the phases are well-resolved due to chemical interaction with the g-C3N4 . It can be concluded that the primary structure (Keggin unit) is preserved after attachment to g-C3N4. This amorphous phase also shows to be affected by change in temperature as shown in Fig. 2 b. The peak becomes broader and less intense as temperature increases from 25 to 50 °C, which signals the formation of an anhydrous structure. The thermal resistance of this phase is higher due to the interaction between the PMo12 anion and g-C3N4. Therefore, the Keggin structure is thermally stable in the studied temperature range. These conclusions coincide with PMo12 supported on TiO2 . The deconvoluted Mo 3d, P 2p, C1s, N1s and O1s spectra of PMo12/g-C3N4 are shown in Fig. 3. The high-resolution Mo 3d spectrum displays two peaks at binding energies of 232.8 eV and 236.0 eV, corresponding to the Mo 3d3/2 and Mo 3d5/2 spin-orbit states of PMo12, respectively . The C1s XPS spectrum of the composite shows two kinds of carbon atoms in different functional groups: C–C/C=C bonds (283.9 eV) and C–O bands (286.8 eV). The N1s spectrum consists of four main contributions. The two main signals at 398.6 eV and 400.4 eV correspond to two types of sp2 hybridized nitrogen: Nα (bonded to two adjacent atoms) and Nβ (bonded to three bordering atoms), respectively, which agrees with the recent work done by Zhu et al. . The position of the O1s signals is located at 529.8 eV and another wider peak positioned at 531.6 eV, which verifies the successful attachment of PMo12 species. Electrochemical measurements (CV and EIS) were conducted to probe the redox activity of PMo12 resulting from their direct dispersion and chemical interaction with g-C3N4. 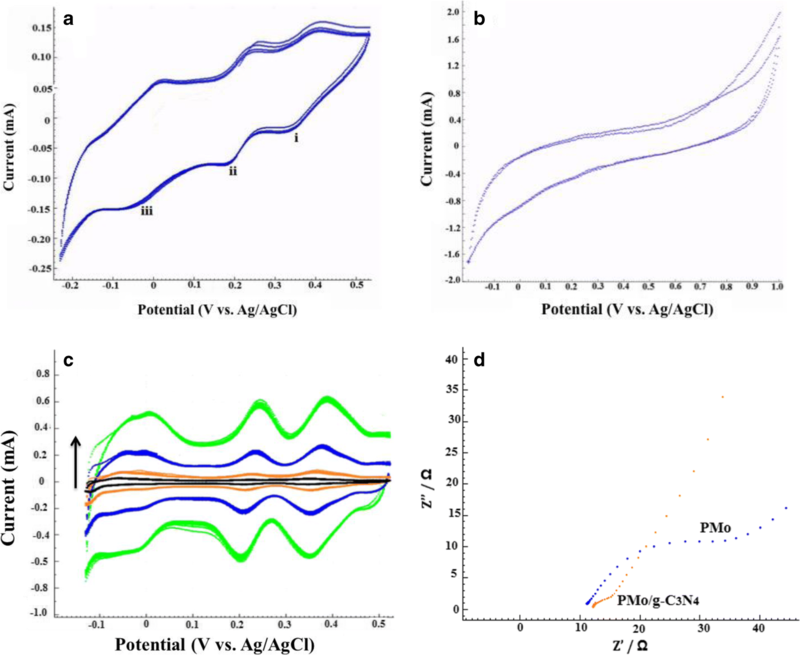 The electrochemistry of g-C3N4, pure PMo12, and functionalized g-C3N4 modified on glassy carbon electrode (GCE) in 0.5 M H2SO4 solution is presented in Fig. 4a–c, respectively. The Nyquist plots of PMo12 and PMo12/C3N4 are shown in Fig.4 d.
The redox activities of the different modified electrodes were studied in a conventional three-electrode system in 0.5 M H2SO4 electrolyte solutions. As illustrated in Fig. 4 a, the CV exhibits three-step redox waves of PMo12 denoted by i, ii, and iii, with the midpoint potentials Emid of 0.35, 0.2, and − 0.07 V, respectively. The PMo12 was not stable during the measurement due to progressive leaching into the electrolyte, as demonstrated by the decreasing amplitude of the peaks with sequential scans. The g-C3N4 (Fig. 4 b) showed no observable redox peaks within the voltage window, which is attributed to the weak electrical conductivity of g-C3N4 and the absence of adsorbed redox species on the surface. Reversible redox peaks are observed for 10% PMo12/g-C3N4/GCE, originating from the stabilized PMo12 and successful chemical interactions which promote charge diffusion. The current response increased with the increase of the scan rate (Fig. 4c), and similar curves with three pairs of redox peaks were observed at all scan rates, with no obvious distortion . This observation indicates sufficient electron transfer from the PMo12 cluster to the electrode in all subsequent redox steps. The shift to lower reduction potentials indicates that the PMo12/g-C3N4 composite has increased electron density on the polyoxometalate (POM) anion and reducibility. Concomitantly, no leaching was observed when the potential was cycled between − 0.2 and 0.5 V. Based on the redox peaks of PMo12/g-C3N4, their peak separations (∆Ep) were calculated to be as small as ≈ 23–26 mV. This allows for the surface coverage to be estimated by the equation for reversible surface-confined species according to the equation: Peak current is directly proportional to surface coverage (Γ) and scan rate (ν). From Eq. 1, there is a linear relationship between ip (and the current at any one point on the voltammetric curve) and ν, facilitating as a useful indicator of a surface-confined species. where n is the number of electrons transferred, ν is the scan rate (V/s), A is the geometric area of the electrode (0.0725 cm2), Г is the surface coverage of the electroactive species, R is the gas constant, T is the temperature (298 K), and F is the Faraday constant. This led to a value of 1.2 × 109 mol cm2 for PMo12/g-C3N4, which corresponds to around 0.66 monolayer coverage. This agrees favorably with the work done by Choi and Kim, based on functionalized Keggin-type polyoxometalates . From EIS results shown in Fig. 4 d, the semicircle radius on the Nyquist plot for PMo12/C3N4 is much smaller than that for PMo12, clearly confirming the PMo12/C3N4 to have improved charge transfer. Concomitantly, the conductance of 52.9 μF for pure PMo12 and 79.5 μF for PMo12/C3N4 indicates that the supported PMo12 has enhanced redox activity. The g-C3N4 allowed for the large inorganic heteropolyanions to remain anchored and exhibit improved conductive behavior. Even in the absence of a positively charged linker (usually applied to provide good interaction), the direct synergy between PMo12/C3N4 improved the accessibility of the POM active sites, improved the redox performance, and demonstrated stable amplitude upon repeated scanning. These results, in addition to structural stability, are important factors contributing to the efficiency of cation insertion electrodes [27, 28, 29, 30]. We have accomplished the chemical synthesis of a hybrid material based on PMo12 successfully attached to g-C3N4 as support; the POMs functioned as electron storage sites, as well as electron transfer mediators. The high surface area of the g-C3N4 allowed a high dispersion of PMo12 down to the molecular level. Spectroscopic and electrochemical investigations revealed that the structure and the electronic properties of the PMo12 are improved as a result of the synergy with the graphitic carbon nitride (g-C3N4). The preparation of PMo12/g-C3N4 was simple to perform, leading to reproducible and stable electrode material. The results show how the local chemical environment influences the electron transfer activity of PMo12. Disseminated PMo12, anchored on g-C3N4 as electrocatalytically active sites, contributes towards higher interfacial charge transfer and proves feasible as active electrode material in technological electrochemical devices. This paper was financially supported by South Africa’s National Research Foundation (NRF).